We are just back from a quick trip to Washington DC. It was the first time I've visited and there is WAY too much to see in one visit. I feel like we only got a glimpse of what they had to offer. You would need to stay at least 2 weeks to see it all properly. Be prepared to walk, and by walk I mean hike 10-20 km or more per day in what feels like a tropical rain forest but looks like DisneyLand for American History buffs. Shoes that I could normally wear without problem turned into raging blister factories due to the overwhelming heat, humidity and non stop trekking. My favorite was the National Gallery, but that is a typical artist's view. 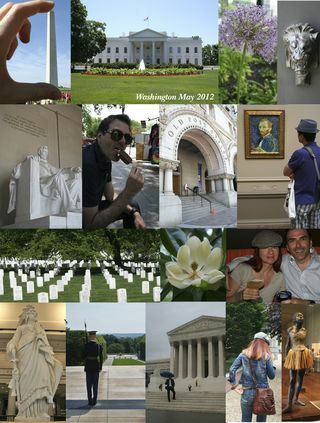 My husband's favorite was the walking tour of the Mall and the Air and Space Smithsonian. I'd like to mention one other piece of information that no one tells you about Washington, so that you don't make the same mistake I did. We stayed at a wonderful hotel called the Mayflower that is the oldest in Washington. I was parched when we arrived and drank a glass of the water from the tap in the room. I can say that it tasted like horrible old stale rusted dirty creek water full of chemicals and it even smelled rancid. I didn't think however that it could be harmful since there were no signs in the hotel or otherwise telling us not to drink the water. Turned out it made me sick. A friend of Robert's that we met there afterwards told us never to drink the tap water as it is infamously bad and undrinkable. It's a very sad statement when one of the most powerful nations cannot provide potable drinking water in their capital city. Otherwise we had a fun time and would recommend a visit just to see all the amazing items and artifacts they have on display. Sounds like an amazing place to visit!